Learn about auditing, and how to set up auditing in Azure SQL Data Warehouse. SQL Data Warehouse auditing allows you to record events in your database to an audit log in your Azure Storage account. Auditing can help you maintain regulatory compliance, understand database activity, and gain insight into discrepancies and anomalies that could indicate business concerns or suspected security violations. Auditing tools enable and facilitate adherence to compliance standards but don't guarantee compliance. For more information about Azure programs that support standards compliance, see the Azure Trust Center. Report on database activity. You can use preconfigured reports and a dashboard to get started quickly with activity and event reporting. Audit logs are stored in your Azure storage account. You can define an audit log retention period. A server policy applies to all existing and newly created databases on the server. If server blob auditing is enabled, it always applies to the database. The database will be audited, regardless of the database auditing settings. Enabling auditing on the database, in addition to enabling it on the server, does not override or change any of the settings of the server blob auditing. Both audits will exist side by side. In other words, the database is audited twice in parallel; once by the server policy and once by the database policy. You want to use a different storage account or retention period for a specific database. You want to audit event types or categories for a specific database that differ from the rest of the databases on the server. For example, you might have table inserts that need to be audited only for a specific database. You want to use Threat Detection, which is currently only supported with database-level auditing. 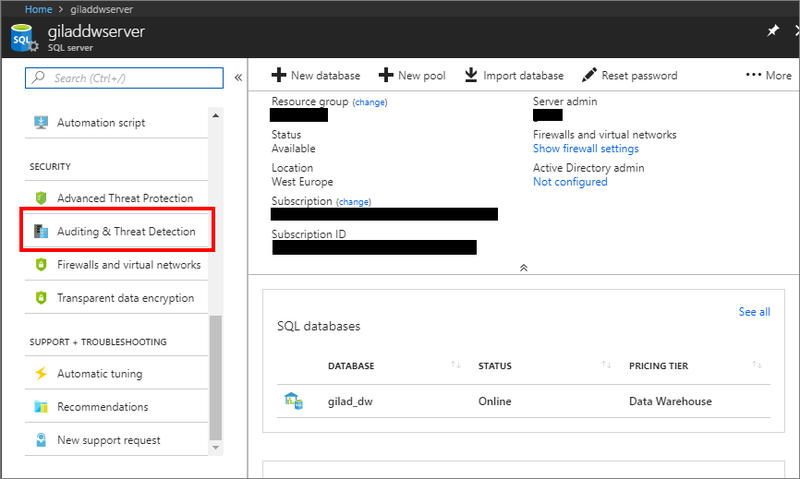 Enabling auditing on an Azure SQL Data Warehouse, or on a server that has an Azure SQL Data Warehouse on it, will result in the Data Warehouse being resumed, even in the case where it was previously paused. Please make sure to pause the Data Warehouse again after enabling auditing. A server auditing policy applies to all existing and newly created databases on the server. The following section describes the configuration of auditing using the Azure portal. Go to the SQL server that you want to audit (important, make sure that you are viewing the SQL server, not a specific database/DW). In the Security menu, select Auditing & Threat detection. In the Auditing & Threat detection blade, for Auditing select ON. This auditing policy will apply to all existing and newly created databases on this server. To open the Audit Logs Storage blade, select Storage Details. Select or create the Azure storage account where logs will be saved, and then select the retention period (old logs will be deleted). Then click OK. Audit logs are written to Append Blobs in Azure Blob storage on your Azure subscription. All storage kinds (v1, v2, blob) are supported. All storage replication configurations are supported. Premium storage is currently not supported. Storage in VNet is currently not supported. You can define an auditing policy for a specific database or as a default server policy. Before setting up audit auditing check if you are using a "Downlevel Client". Go to Settings for the SQL Data Warehouse you want to audit. Select Auditing & Threat detection. Next, enable auditing by clicking the ON button. In the auditing configuration panel, select STORAGE DETAILS to open the Audit Logs Storage panel. Select the Azure storage account for the logs, and the retention period. Use the same storage account for all audited databases to get the most out of the pre-configured reports templates. Click the OK button to save the storage details configuration. Under LOGGING BY EVENT, click SUCCESS and FAILURE to log all events, or choose individual event categories. If you are configuring Auditing for a database, you may need to alter the connection string of your client to ensure data auditing is correctly captured. Check the Modify Server FQDN in the connection string topic for downlevel client connections. Server-level audit logs are written to Append Blobs in an Azure Blob storage on your Azure subscription. They are saved as a collection of blob files within a container named sqldbauditlogs. For further details about the hierarchy of the storage folder, naming conventions, and log format, see the Blob Audit Log Format Reference. From the SSMS menu, select File > Open > Merge Audit Files. The Add Audit Files dialog box opens. Select one of the Add options to choose whether to merge audit files from a local disk or import them from Azure Storage. You are required to provide your Azure Storage details and account key. After all files to merge have been added, click OK to complete the merge operation. The merged file opens in SSMS, where you can view and analyze it, as well as export it to an XEL or CSV file or to a table. Use the sync application that we have created. It runs in Azure and utilizes log analytics public APIs to push SQL audit logs into Azure Monitor logs. The sync application pushes SQL audit logs into Azure Monitor logs for consumption via the log analytics dashboard. Use Power BI. You can view and analyze audit log data in Power BI. Learn more about Power BI, and access a downloadable template. Download log files from your Azure Storage blob container via the portal or by using a tool such as Azure Storage Explorer. After you have downloaded a log file locally, you can double-click the file to open, view, and analyze the logs in SSMS. You can also download multiple files simultaneously via Azure Storage Explorer. Right-click a specific subfolder and select Save as to save in a local folder. After downloading several files or a subfolder that contains log files, you can merge them locally as described in the SSMS Merge Audit Files instructions described earlier. Use the Extended Events Reader C# library. Query Extended Events Files by using PowerShell. Database-level audit logs are aggregated in a collection of Store Tables with a SQLDBAuditLogs prefix in the Azure storage account you chose during setup. You can view log files using a tool such as Azure Storage Explorer. A preconfigured dashboard report template is available as a downloadable Excel spreadsheet to help you quickly analyze log data. To use the template on your audit logs, you need Excel 2013 or later and Power Query, which you can download here. The template has fictional sample data in it, and you can set up Power Query to import your audit log directly from your Azure storage account. In auditing configuration panel, which is described in the preceding setup auditing section, change the Storage Access Key from Primary to Secondary and SAVE. Go to the storage configuration panel and regenerate the Primary Access Key. switch the Storage Access Key from Secondary to Primary and press SAVE. 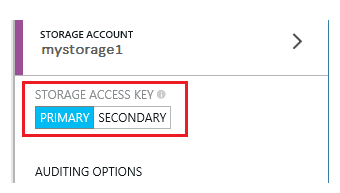 Go back to the storage UI and regenerate the Secondary Access Key (as preparation for the next keys refresh cycle. Auditing works with SQL clients that support TDS redirection. Any client that implements TDS 7.4 should also support redirection. Exceptions to this include JDBC 4.0 in which the redirection feature is not fully supported and Tedious for Node.JS in which redirection was not implemented. Remark: The preceding server FQDN modification may be useful also for applying a SQL Server Level Auditing policy without a need for a configuration step in each database (Temporary mitigation).